Preheat oven to 425°F. 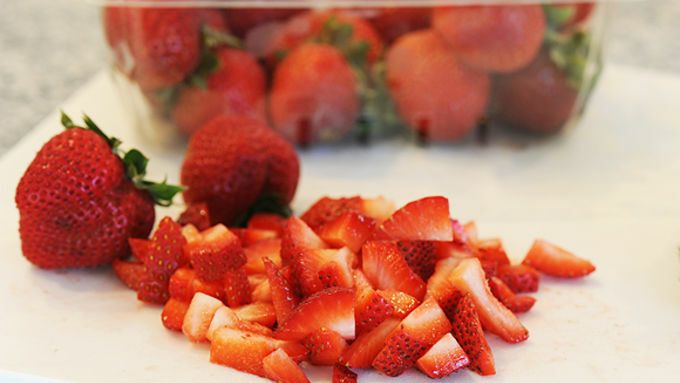 Cut strawberries into small chunks. Toss with the 3 tbsp of sugar, and place in refrigerator to macerate. 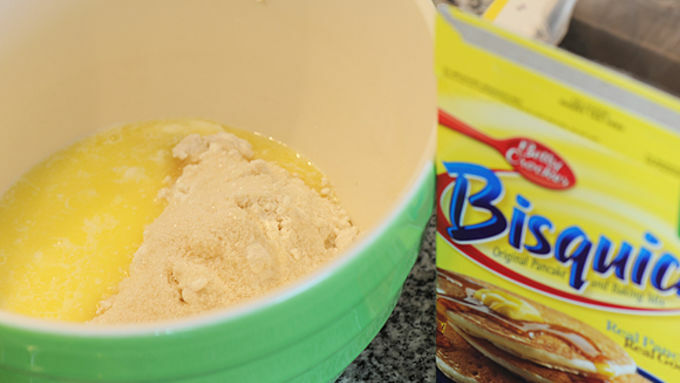 Combine the Bisquick™, sugar, melted butter and milk in a medium bowl. Mix until a soft dough forms. Divide the dough into six portions. Mix each with a few drops of food coloring (4 to 5 drops for each color) to make the rainbow colors: red, yellow, orange, green, blue, purple. Working quickly, divide each color into several small chunks. Form small balls with one of each color. Pat the balls together to make a round about 8 inches in diameter and 3/4 of an inch thick. Cut with a 1-1/2 inch biscuit cutter. Pat dough remnants together lightly, and cut out more rounds until you have about 20 total. Arrange rounds on a cookie sheet and refrigerate for about 15 minutes. 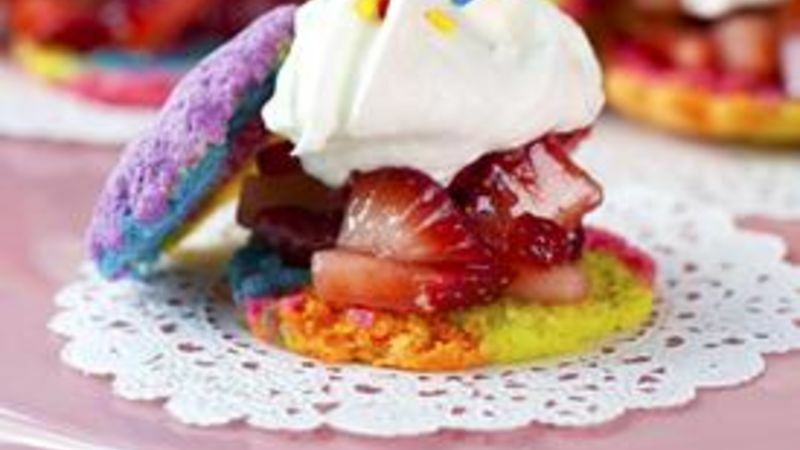 To serve, split the biscuits in half with a serrated knife, and top bottom half with strawberries, whipped cream and, naturally, rainbow sprinkles. Prop top half on the side. It’s 90+ degrees outside. The only thing I really want to eat is a cool, refreshing dessert. But even then, just a bite will do. A tiny shortcake bite is just the ticket! So, I thought I’d put a rainbow spin on my usual tiny shortcake bites for Tablespoon. 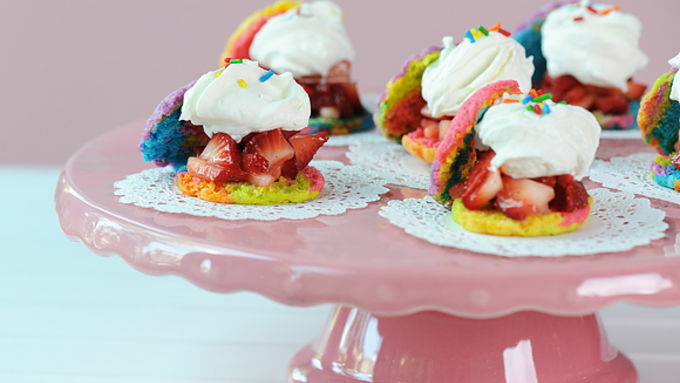 In addition to their rainbow-y goodness, Rainbow Strawberry Shortcakes are the perfect tiny summer indulgence … literally two bites of perfection. If you don’t completely overload them with berries and whip (difficult not to, I know), you actually can safely eat them, sandwich style. Serve in an appetizer spoon, or a tiny appetizer plate, rainbow-ed or sans, but by all means serve them! And the best thing is that the shortcakes are made with Bisquick, so there’s no tricky cutting of shortening into the flour with a fork, worrying about rising, etc. Just mix, shape, cut and bake. Perfect every time. I may be biased in my Bisquick shortcake making ways. But, I tell it like it is, To serve, split the biscuits in half with a serrated knife, and top bottom half with strawberries, whipped cream, and naturally, rainbow sprinkles. Set top half rakishly on the side for absolute cuteness.